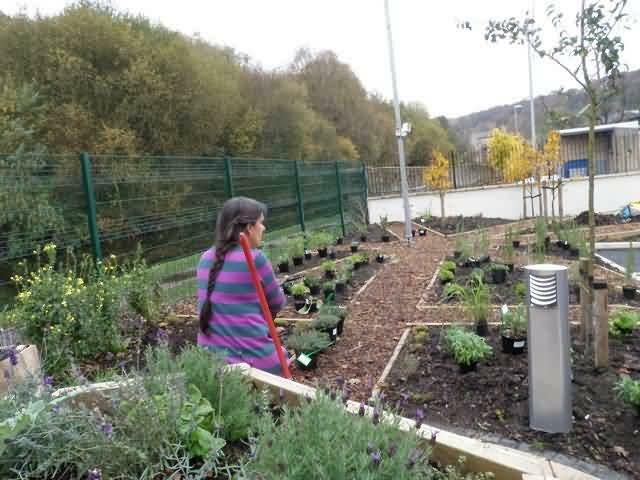 In its early days, IET together with Todmorden in Bloom, had created a fabulous community herb garden on Burnley Road, turning a drab stretch of grass into an oasis of peace and well-being, enjoyed by many. 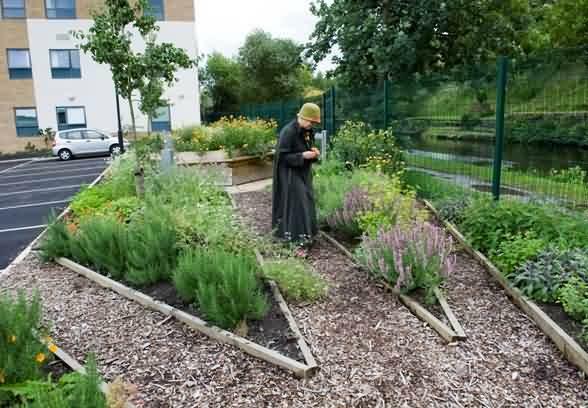 Helena had a lifetime interest in herbs and herb-growing, and during summer excursions at home and abroad, had visited a number of apothecary gardens. 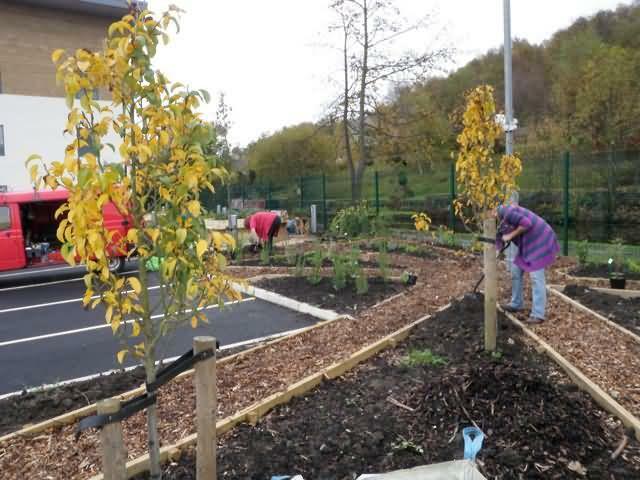 When IET voiced interest in creating an edible utopia in the new health centre grounds, an Apothecary Garden seemed to be the ideal accompaniment, fulfilling the edible content, and linking with the traditional setting of apothecary or physic gardens in the grounds of hospitals. 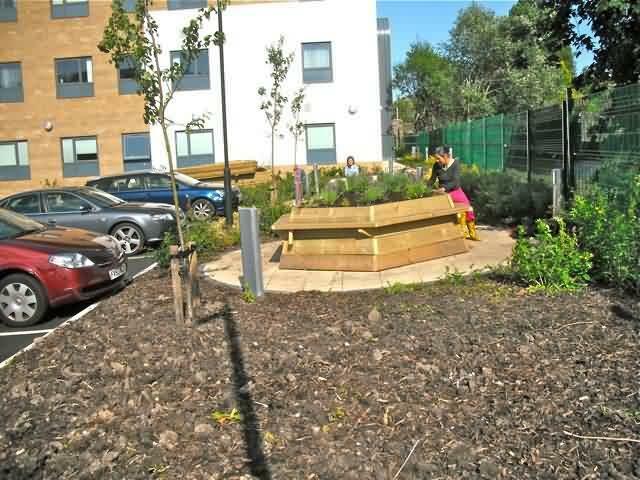 The creation of the garden was the work of a variety of volunteers, with the help and support of health centre staff, especially the health centre manager, Tracy Wilson, and the doctors; the building’s owners Assura; Northern Gas Networks, who gave significant funding, along with B&Q, who donated timber and lavender. 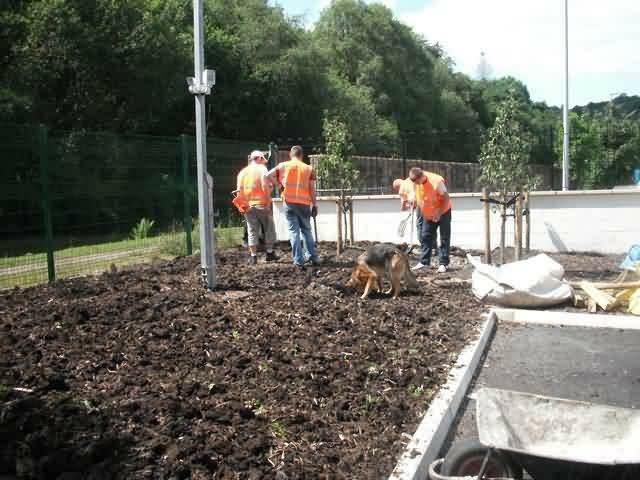 Calderdale Council donated woodchips for the pathways. 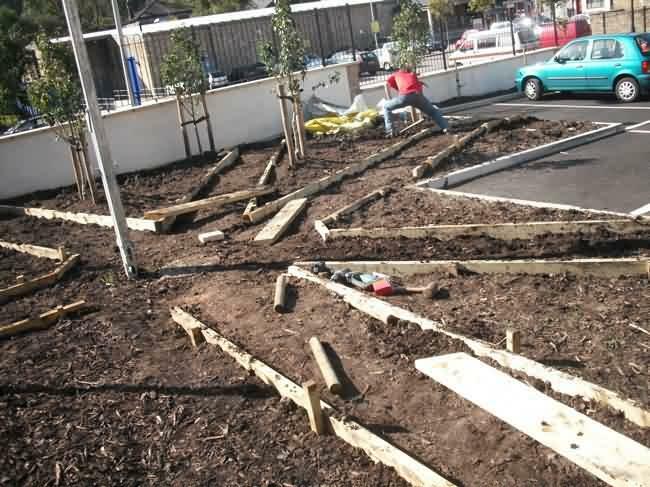 Community service helpers removed the prickly shrub-planting, prior to preparing the ground for the herb garden layout. 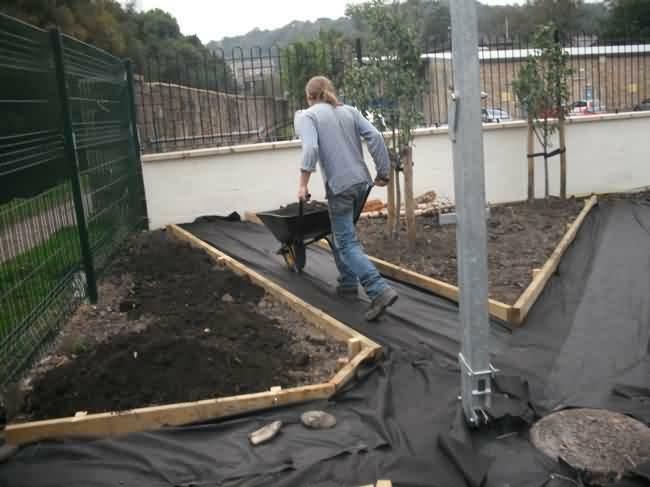 Dave McKnight, one of our younger volunteers, helped Nik, working on building the edges of the beds for the herbs. 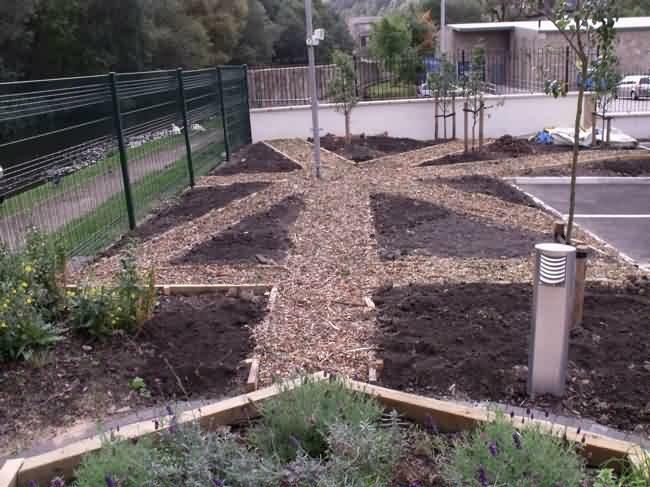 Mick wheels in topsoil to go in the beds…wood chipping went on top of the weed-excluding fabric to create pathways between the beds. 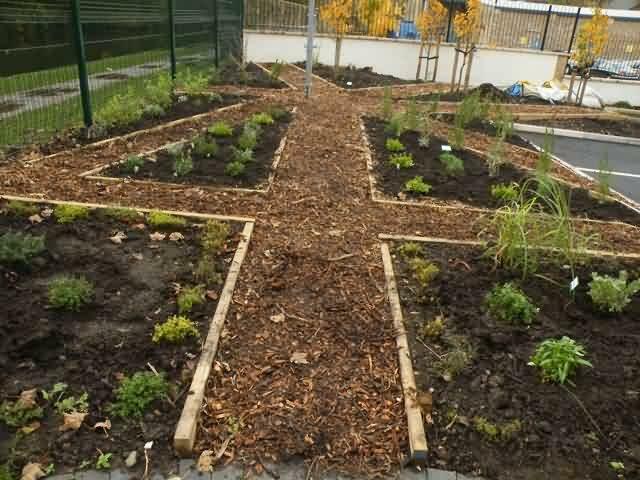 All done, and ready for the herbs. 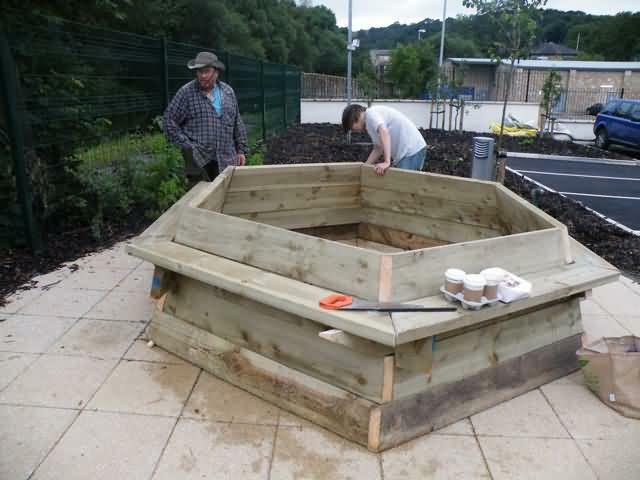 Nik and Dave put the finishing touches to the first of the seating planters. 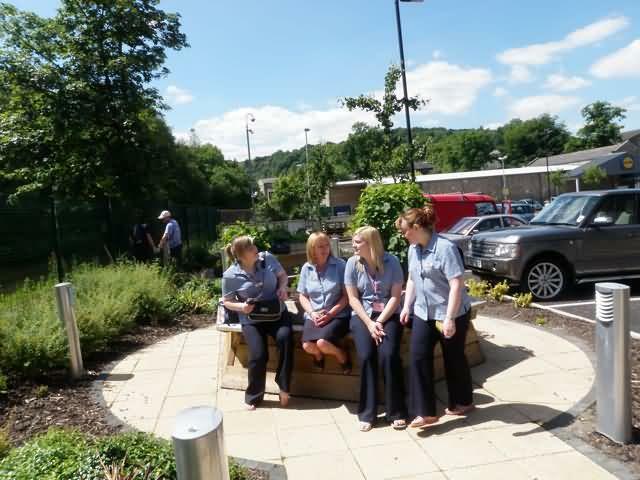 This one is planted up with lavenders, thymes and beautifully sweet Alpine strawberries…all designed to offer a relaxing place for staff to chill and de-stress. Helena and Nik headed off to the wilds of East Anglia during the half-term holidays in October 2009 to visit another young IET volunteer, Nina…once she was on board the ‘herbmobile’, we went in search of herbs for the garden. 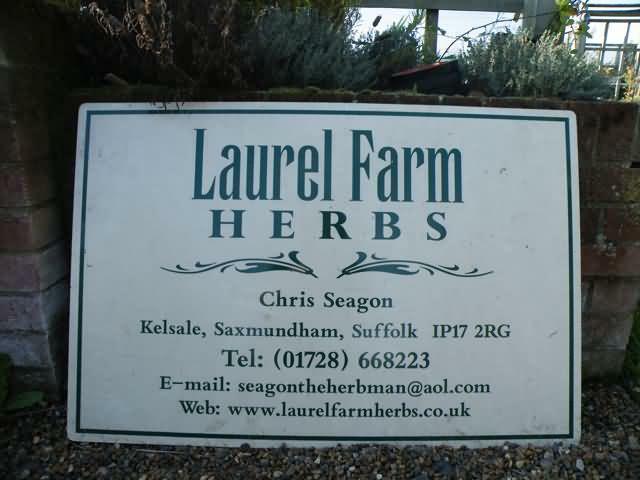 A previous supplier, Sarah Clarke, formerly based in Yorkshire, had relocated to Suffolk, and while we were on the way to visit Green Garden Herbs, we stumbled across Chris Seagon’s Herb Nursery…a fabulous place. 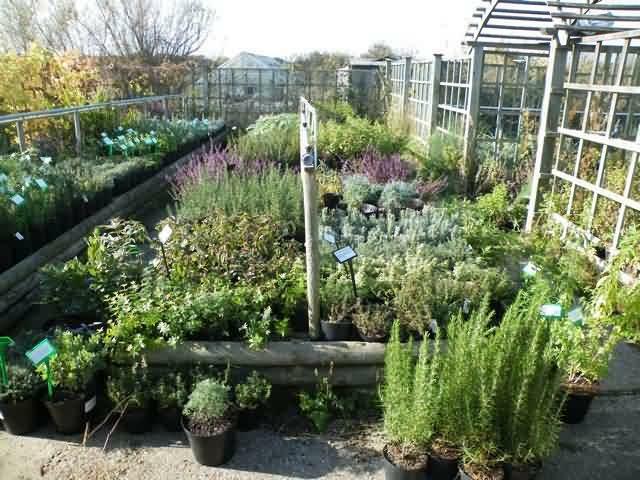 Herbs galore! 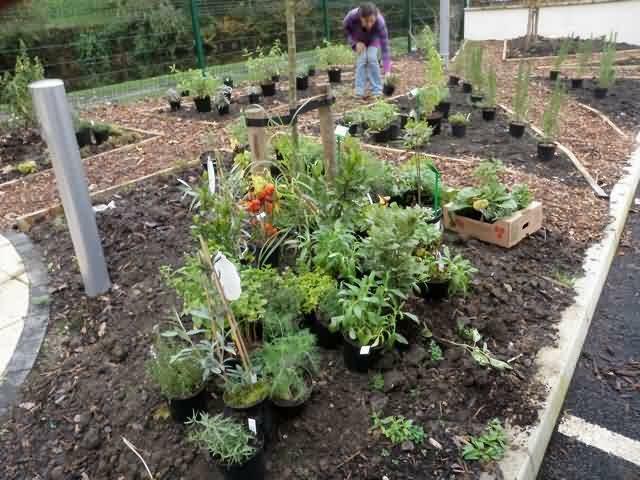 And we bought a lot of well established plants to give structure to the garden. 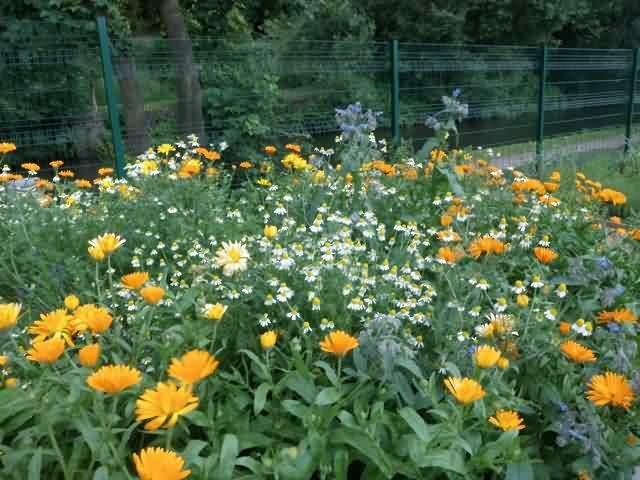 Seeds from Sarah Clarke were raised in volunteers’ greenhouses and planted within the established plants the following spring. 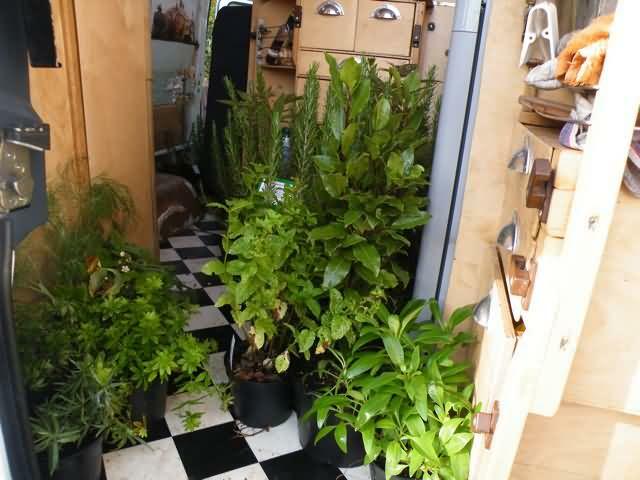 Back in Tod and time to unload and decide where the plants are to go…it was great to see it all start to come together. 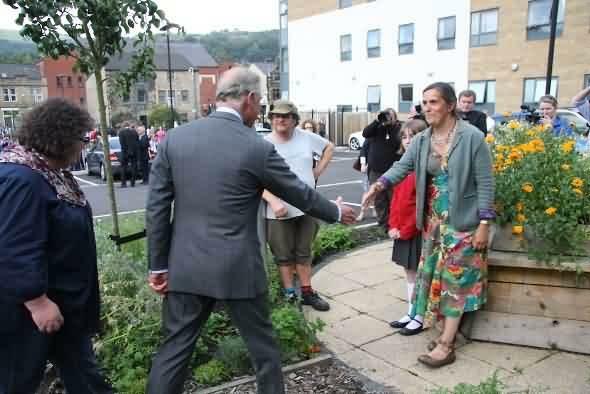 Nab a passer-by to help..Thanks, Dawn – you really helped speed up the work. 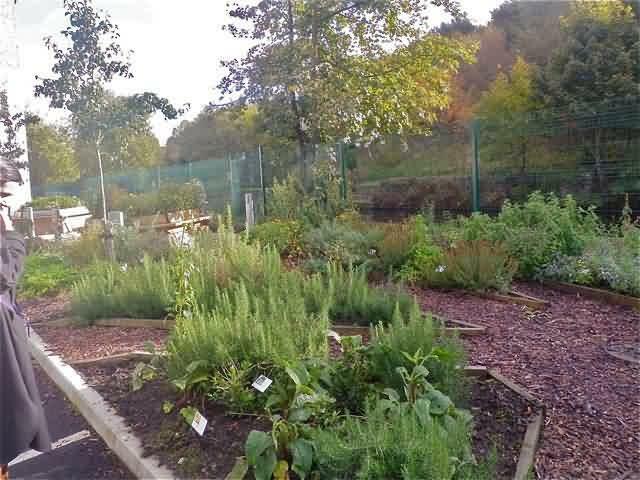 …we hope that folk who have particularly unusual herbs in their own gardens, will let us have cuttings, or better still, come forward to be more involved in the evolution of the Physic Garden. The herb group meets about once a month for a sit-down meeting, and as and when the garden needs work (usually once a week or so in the busy summer months). See the contacts page for details.